Bu Owen Griffith ar y môr am bymtheg mlynedd cyn dod adref i gadw siop ei dad yn Mhencaerau, a dod i hynodrwydd fel "Meddyg y Ddafad Wyllt" Isod mae cwpwl o luniau o'r llongau y bu yn gweithio arnynt. "Dominion" Owen canol yn cefn. 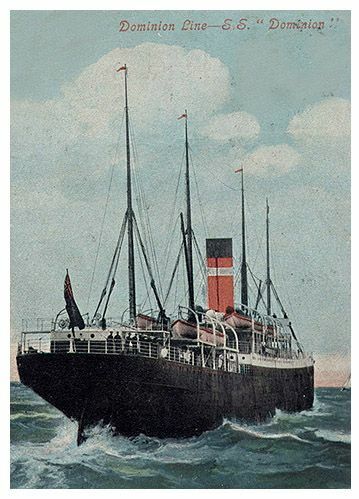 DEMODOCUS was built in 1912 by Workman Clark at Belfast with a tonnage of 6689grt, a length of 443ft, a beam of 52ft 9in and a service speed of 11 knots. Sister of the Perseus she was completed for the China Mutual Steam Navigation Co. in June 1912. She was taken over under the Liner Requisition Scheme in 1917 and on 23rd March 1918 she was torpedoed UC-53 in the Mediterranean with the loss of six lives. However she did not sink and was towed to Malta for repairs. In January 1949 she towed the Lycaon, which had lost her propeller, to Cape Town, a distance of 850 miles. During this time the Demodocus lost 20 days voyage time and consumed an additional 1154 tons of coal. Therefore, she claimed for loss of profit (£128 per day) and salvage against the Lycaon. The Court of Admiralty awarded £12,500 to the owners, £350 to the captain and £2400 for division amongst the crew. A legal nicety bearing in mind that both ships were owned by the same company. In 1951 she was sold to Ditta Luigi Pittaluga Vapori of Italy for £51,000 and renamed Ircania. Five years later, in 1956, she was purchased by P. Tomei of Genoa who renamed her Miriam. On 10th October 1958 she arrived at Trieste where she was broken up. Diolch i Mrs J Hughes am y Lluniau yma.